Renee’s love of food started at an early age as she remembers the aroma of her mother’s fresh baked goods in the morning. As an active adolescent throughout high school, her main interests were health and wellness. After completing the human kinetics program at university, she decided to follow her passion for food and nutrition and enroll in the Canadian School of Natural Nutrition to become a holistic nutritionist. She currently resides in Kelowna where she has her nutrition practice and continues to create healthy delicious recipes. She advocates for ditching the diet and switching to a lifestyle where incorporating nourishing food every day. Renee is our phenomenal recipe-guru! She applies her talents as a holistic nutritionista and creative cook to design recipes with our many different kinds of pasta. See our numerous delicious recipes here, if you haven’t already checked them out! – Because they use honeycombs! 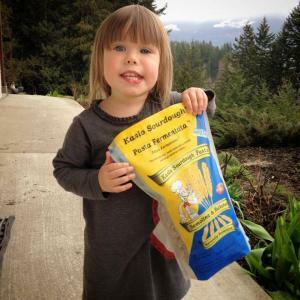 At Kaslo Sourdough, family is paramount. We value being able to sit down at a table as a family together, eating good food. Sofie is the first of our third generation! And she has tested all of our pasta varieties! Considering how much she loves ALL of them, we’re marking it as kid tested and kid-approved (though don’t rely on just her judgment: when we’re out on the road at demos, we frequently hear from parents that are thrilled they have a pasta their kids love, too!). Heading home after a long day at Oma’s with her favourite pasta. Sign up to receive our latest pasta news!